Our land is full of brilliant minds and a lot of talent is been in remote areas but without proper platform to perform their skills. In remote areas of KPK, many times, students performed well in international competitions and now studying in US and England on scholarships. The need here is to give them proper platform to show their talent and nurture their skills so they could become asset of the country. 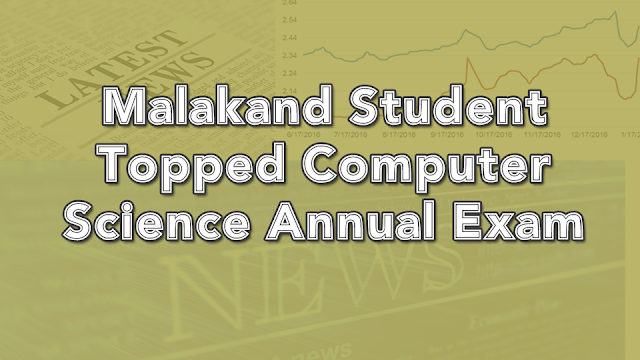 A student from Malakand board has topped that FSC computer science annual examination and got 869 marks. The KPK‘s minister of elementary and secondary education Muhammad Atif Khan on the behalf of CM, Pervaiz Khattak presented him the cash prize award of 500,000 rupees. The student participated and attained first position in province in computer science ETEA exam. In the ceremony, the additional secretary education, Qaiser Alam and the father of student Shah Faisal, Farman Ali was also present. In his address, the minister Atif Khan said that position holder students of public schools should be awarded by the government as they don’t have access to education facilities like that of private students. He added that parents of the government school students don’t have enough resources to send their children to private schools for the quality education but the provincial government of the province now taking several steps to upgrade the facilities in public schools.He said that for this purpose, the government has decided to give cash prized to the brilliant minds of schools and colleges in order to encourage them. He further said that for the elimination of the cheating culture, we have taken number of steps. He briefed that this is the first time that the provincial government has allocated such a large amount of money for the education sector and with the use of funds, the improvement is visible to all. The minister congratulated the students Shah Faisal and his father on his success and hoped that in future; the boy will attain the success in the same way. Malakand is one the most deprived area of KPK and such performance show the talent, we have in deprived regions. The boy performed and topped even with low facilities in government schools. The government should provide extra fund for the schools of remote areas and start the encouragement programs for the students, which is the need of time. The federal government has to collaborate with KP government in this regard and in the terrorism hit areas of KPK , the students of the government schools should be given the stipend in case, they perform well in examination.